For as bitter as failure tastes it is a quick acting medicine. I never wanted to step up there unprepared again. I never wanted to feel deep fear for the people I was helping and end up paralyzed. There will always be room for mistakes in my life but only so long as I fix the ones that arise. I re-forged the powerpoint until each slide became less dense with random words and only the necessities were left. I straightened out animations and visuals to as clear a point as I could get them. With a bit of recollection I remembered some disciplinary methods I could implement as well. More important than anything I had fallen back on the old tricks I had learned years ago to get some confidence back. Sometimes it felt silly to say to myself that I could do something but materializing the words meant that I could cling to them like water wings until I could tread water. It also helped tremendously to see in a group chat that many of my fellow foreign teachers experienced the same dilemmas. Many of us had overestimated what the kids knew or what we could do in the first couple days. Back from scratch and heading into the next two classes with some more confidence, the plan straightened out into something closer to what I had imagined. Standing before an energetic class of eager third graders who had never seen a foreigner did not shock as bad as when it was an entirely novel experience. The crooked teeth of ten year olds could not cannibalize me. The dynamite eyes of explosively energetic children could blow down the mountains in the class’s way as much as it could tear us all apart. It was up to me harness that energy. 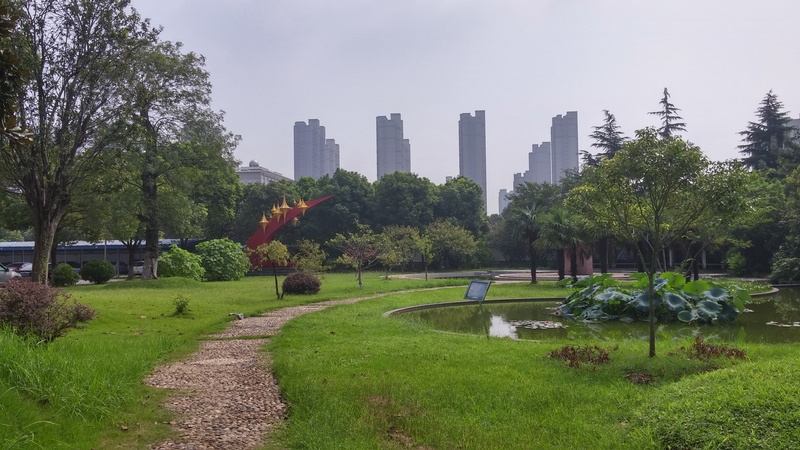 A picture of the gardens at the entrance of my school, Wujin Star. Much was up to me and that became clear with every minor correction and addition. An ounce of effort from me could mean a pound from them. When I smiled half of them would too. When I got into a song it could sway the back of the class and when I was too tired I’d have to circle like a shark for anyone not trying. In that way less effort in one area meant more in a few others. There were classes that were battles no matter what. But you fight out those battles until you strike quick and targeted. Stickers and treats as rewards helped many students snap into the work. Bribing the children with stickers and cookies made them eager to speak at every opportunity, but it had a serious side effect. I’d stand in between the rows of desks scanning for a kid that hadn’t had the opportunity to talk. Quietly at first, I’d hear the exertion of kids trying to stretch their arms out of their sockets and up to the sun. How it would build. How the noise would swell until I’d hear “teacher” nearly screamed in English as well as Chinese and see a sea of arms reaching out for those stickers. I could not even imagine the days when stickers had that magic – an affirmation you needed to possess. The subtle understanding of a cookie as something ten times bigger than a little sweet had completely left me even at this shallow stage of adulthood I am at. After each class I’d come out panting and demanding water, but my eyes would be wide and I’d find the teacher that helped me after class just so I could run my mouth off a bit just to lose some excess energy. At times I’d even strike gold and get advice. It was always to change the simplest things, but more than a few times the simplest things made a world of difference. Dialogues do not work in bullet points, they work in A’s and B’s or Jacks and Jills. Vowel sounds ought to come before the words featuring them. Their mouths have to churn conscious to chew up every word. Only one person in the room could subconsciously devour whole English sentences, unhinged snake jaw style, and that was me. Sometimes the other Teachers taught me unintentionally. A bit of close listening and I’d learned some Chinese instructions to stumble over with ugly Mandarin side of my brain. When a teacher told me how she was pleasantly surprised not to have to translate my instructions the entire class I started to feel like I could actually do this. I still need to learn the Mandarin phrases to keep the kids in line and cannot manage a class entirely on my own, but I can wait to reach that point. Right now baby steps feel like lunges, so I’ll hold out until I find a good stride. The abstract star that is something like my school’s logo. In between classes I managed some English interest classes with the help of one of the third grade teachers. I talked about the basketball game H.O.R.S.E. and played basketball with a few of the kids. Around the same time I sat in with the teachers and had a collaborative lesson planning session with the teachers. We shared some snacks and I taught them the word “raisin.” It made me realize that it was a bit of an anomaly. Why not just call it a dried grape like every other fruit? Then I realized raisins deserved a little more. Dried banana slices could not step to the raisin box on a shelf in every kid’s house. Raisins justified bran based cereal, something dried apple could never claim. After I told them my lesson plan and they had serious skepticism about me teaching the pronunciation of two vowels over one class. In my mind I could not fathom stretching out a vowel over forty minutes. We all agreed to try it out and if it did not work I’d retreat to a vowel a week. Honestly it felt strange to teach by vowel anyways, but most methods seem arbitrary in some way. I’d have a chance to prove my plan just once this week. One class had gotten a lecture ahead. It was the one class that I had taught on my very first day, class 9. This time I stepped in with a lesson plan that had the backing of some experience, even if it was fledgling stuff. More than that, the fear and paranoia that riddled me once had abated now. Teeth were just teeth, eyes were just eyes, energy was just energy, and the kids were just kids. The boy that asked me if I was happy earlier had been in my interest class and was one of the best English speakers in the grade. I had played basketball with him. This time he did not feel the need to ask that question. The rest of the class was still raucous but I realized it was not out of derision. They had a raw interest in the strange words they heard me say, and the odd way that I carried them. They were invested in the way they were supposed to be to the point that they’d repeat any word I’d said. After leading them in a chant, I’d say “very good!” and they’d say it back to me in a chorus. It threw me off a bit at first, but I could not help but laugh it off after a while. Maybe more illuminating than anything, the kids of class 9 managed my review section perfectly. They knew almost everything of the class I thought I had botched beyond repair. The nervousness that I had was toxic. Drinking it in I’d think that I couldn’t do anything, and drinking those thoughts in I’d inch closer to the point where I actually couldn’t. Introspection matters, but never to the point that it should fog up the outer world. I would keep trying to improve, but that improvement could only come with confidence. When I said my goodbye, the teacher expressed remorse over the wildness of the class and her not bringing them in line. I felt confident enough to say that was false modesty. The class went well. So had the week. 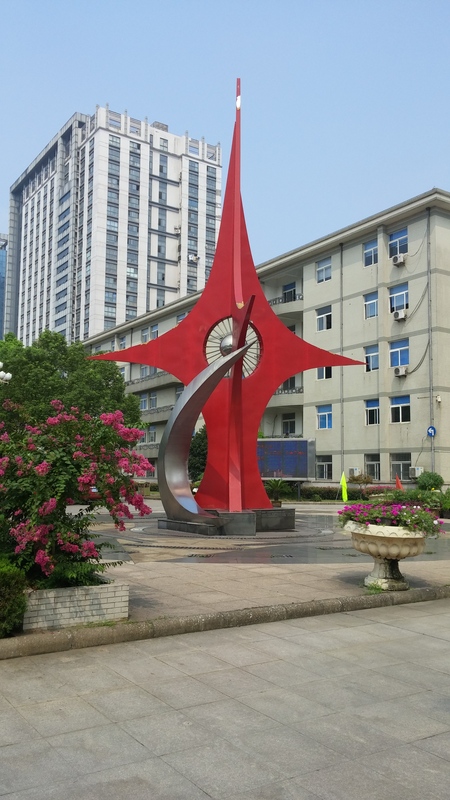 I really liked learning about teaching English in China, plus I got tips from your blog on 14 Tasty Foods to Burn Fat! Finally, someone get’s something useful from this God forsaken blog! Seriously though, thanks for reading and for the kind words.